Some weeks ago I published in my local language on the net a text titled Huiskamerkunst. Huiskamerkunst literally translates as living room art – but that does not quite capture the Dutch expression. Kamer translates well into room, especially of a building; and kunst is art just as in English. But ‘huis’ is more than the English house, it also means home. House art, Huiskamerkunst, is art that is private, art that is associated with your lifestyle, it is art of your choice as opposed to art that is made public by choices made by museum curators, gallery directors or other authority. I wrote that I, in my current post-modernistic disposition, am a supporter of house art as a thing to do for artists and as a thing to acquire for those living in houses - that is most of us by far! I shall first give you the reasons for championing house art and next make a comment on the postmodern art condition. One. My first argument refers to the dominance of large scale art in galleries and art museums. I note that with few exceptions artists who break through to the exclusive, international/global art scene do so by the production of extravagantly large works; works, furthermore, that must be innovative if not shocking made by an artist who equally so preferably is not an ordinary person but must have special properties (raised in the ghetto, gay, ethnic minority, alcoholic, drug abuser) or any other exotic attribute s/he may have that contributes to the creation of a ‘newsworthy’ story. In short: the kind of public image that convinced large sections of the (western) public that contemporary art is not for them. The large works are made for circulation in the commercial, fashionable, international art circuit controlled by an in-crowd of major gallery owners, prominent curators, art museum directors, collectors and investors plus the associated clique of art critics and publicists – this is the world of big bucks. Big bucks for mega objects for large spaces. Two. 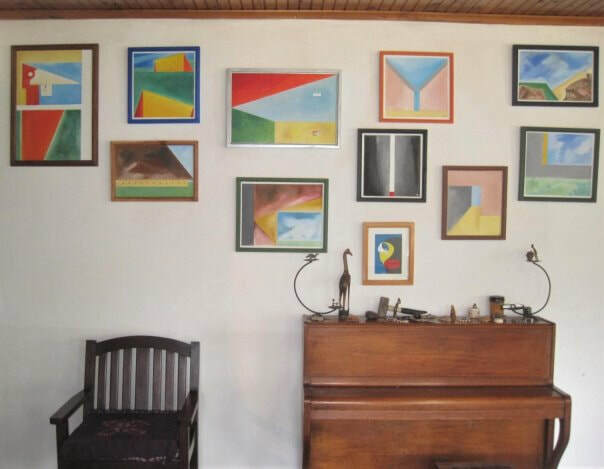 House art, in contradiction to large gallery art, is small, inclusive, and can be displayed anywhere. The world is full of houses and these houses have rooms where art can be displayed. These rooms may be cozy, businesslike, sleezy, sordid, high class, low class, middle class, classless, bare, crowded or empty, you name it – displaying in their variety the variety of the people who live there. House art is not directed at a singular elitist audience, it is for a multitude of divers people and hence allows a multitude of divers styles and subjects. Three. House art is mobile, easy to move about and around, you can sent it by post. If fed up or in need of change you shift the work to the attic and replace it with a fresh item. House art is handy. Four. House art is affordable and makes an excellent leisure time activity. Building up a (small) house collection** also could be an good investment - if develop an interest in art and are able to recognize quality. You need to develop ‘an eye for art by art.’ And if you do so you may get a better return on your money than presently our unprofitable banks or pension funds are giving you. You’ll be surprised, once you start scouting for art, how much good and affordable art is available right in the area where you are living. Artists are everywhere all over the world and for many the lack of a link to a buying public is a major impediment in making a living out of art. Five. The mission of art is to enrich our lives by sensible imagery and such enrichment can take place daily in the living room, in your private domestic sphere. Extraordinarily ordinary. Finally, the house art enterprise returns the artist to a sensible position in society, that of a craftsman or women whose craft it is to make art. The artist, in a sense, is closer to the plumber than to the prophet, the mentally deranged, the pop star or the joker. The difference between artist and the plumber or other artisan is that the artist makes objects that are images in and about (outer & inner) reality and the plumber makes objects that are part of outer reality as objects and not as images. House art offers an alternative to what Kandinsky*** so appropriately called “this wild hunt for notoriety” that befuddles modern western art since the beginning of the 1900’s. How did I get into post-modernistic house art? Let me say at the onset: it was not deliberate, it happen more or less incidentally. The house part is easiest to explain. I do graphic art and oil painting. Work that is done I remove from the studio. In the studio I only want to see ‘work in progress’ of which there is plenty. Drawings are placed in a portfolio or framed for display. Paintings are also framed and made ready for exposition. Oil painting should be exposed to indirect light for continued ‘drying’ (e.i., the prolonged process of oxidation and polymerization) and to prevent yellowing of the linseed oil. So when I had a good number done I asked myself where to put them. Hey, what about the living room? And I put them up – see photo. ​Photo 1. The author's house art. From left to right: Peli 47, Stable, It’s a Goal, Space Mouse, Unborn, Red Square, Crying Bicycle, Pink Shirt on Blue Foundation, Construction 2, Laying in Landscape, Straight Edge. The result was surprising, an eye opener indeed. First for myself. By creating an overview of my recent painting it became much clearer what I was concerned about in my imagery – its redundancy surfaced and with it one aspect of meaning. Seeing this strengthened me in the sense of what I was doing. One recurrent theme in my work is the question: what is this image? And this question is posed deliberately. Second, as house art starts in the house of the artist an opportunity arises to register responses and non-responses of kin, friends and visitors. Most folks kind of ignored the paintings in view but some responded and these responses made me feel good. These are responses of people who tried to answer the question of what the image is about and were not deterred by the lack of an immediate answer. They came up with their own interpretation, sometimes one that coincided with mine, sometimes one of their own but that difference does not matter and is less important than the act of interpretation itself. An artist should not, I believe, paint just to please a specific audience or for the sake of commercial success. But a professional artist does not make art purely for his/her own satisfaction – professional art is made to be exposed and to participate in social life. Social life starts at home, not in some remote exotic gallery or art journal publication with its obscure rhetoric. So as an artist you try to entice the viewer. You know you cannot entice all of them but if you cannot entice any of them you need to consider what you are doing. Yes, if you are in a league with Vincent van Gogh there is no need to worry – he sold only one painting in his entire life – but those were different times. Today you can make your work accessible globally by The Net. Then, at last, the postmodern business. What is postmodern art? Frankly, I only found out recently that there is something like postmodern art when I was checking out postmodernism in the social sciences at the highly laudable Wikipedia. That’s how I found out postmodernism also spread to art. Postmodernism in art is not a clearly defined singular concept, neither is it a movement but rather is a label subsuming all sorts of things. This lack of definition helped me considerably in classifying my own recent or even older work as post-modernistic. (Note: I do keep a prudent distance from the true postmodern art rhetoric)! The Art Story, on the net, says about the postmodern way: “...ironical and playful treatment of a fragmented subject, the breakdown of high and low culture hierarchies, undermining of concepts of authenticity and originality, and an emphasis on image and spectacle.” (https://www.theartstory.org/definition-postmodernism.htm). And: “Postmodernism overturned the idea that there was one inherent meaning to a work of art or that this meaning was determined by the artist at the time of creation. Instead, the viewer became an important determiner of meaning, even allowed by some artists to participate in the work as in the case of some performance pieces.” The Tate site says: “Postmodernism can be seen as a reaction against the ideas and values of modernism, as well as a description of the period that followed modernism's dominance in cultural theory and practice in the early and middle decades of the twentieth century. The term is associated with skepticism, irony and philosophical critiques of the concepts of universal truths and objective reality.” (www.tate.org.uk/art/art-terms/p/postmodernism). P.S. If you do go for house art buy directly from the artist. Saves a lot of money and you are likely to have a good time. * The author is an artist, anthropologist and i-net publicist working in Zambia. ** If you do collect read my publications: Keeping Art (Url: http://www.zfactorart.com/keeping-art.html) and The Matter of Art and Artist (Url: http://artblog.zamart.org/2013/08/caring-for-your-art-work-prints.html or http://www.zfactorart.com/the-matter-of-art-and-artists.html). The first publication is about proper display and storage of art, the second one is about the proper construction of a work of art. *** Kandinsky, Wassily. Concerning the Spiritual in Art. 1977 (reprint of 1914 English original). New York, Dover Publications Inc.